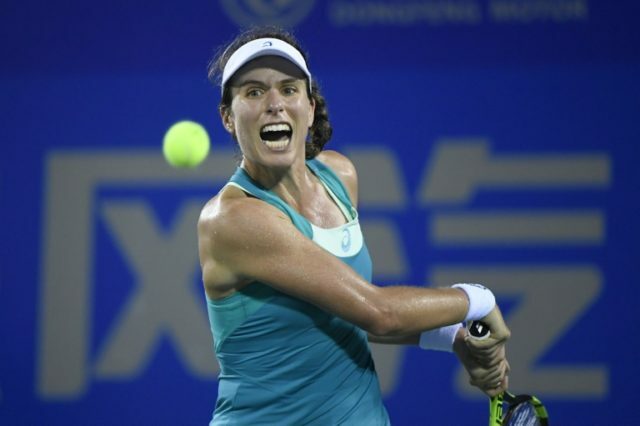 Wuhan (China) (AFP) – Johanna Konta crashed out of the Wuhan Open Monday, joining an exodus of top seeds including US Open finalists Sloane Stephens and Madison Keys after a shock-prone beginning to the Chinese tournament. Konta, who was handed a bye as the fifth seed, failed to get on the scoreboard against Australia’s Ashleigh Barty in the first set but appeared to be staging a comeback when she led 3-1 in the third. The 26-year-old Brit, who went out in the first round at Flushing Meadows, served for the match but eventually succumbed 6-0, 4-6, 7-6 to Barty, ranked 37 in the world. Konta was also joined by reigning-champion Petra Kvitova in an unexpected early exit, with the Czech number 11 seed losing to China’s Shuai Peng 7-6, 6-7, 7-6 after a thrilling three-and-a-half-hour, three-set epic. At a post-match press conference, Konta said she “fought incredibly hard and made a match out of it”. “I was unfortunate not to come through but I think that’s also part of sport, you can’t be successful all the time,” she added. Kvitova, who was hoping for her third victory at Wuhan, said she was not used to playing such long matches. “I was cramping at the end so it was pretty challenging for me and in one way I’m pretty proud of myself that I was able to fight,” she added. Hours earlier US Open winner Stephens suffered a shock defeat at the hands of China’s Wang Qiang in the first round. That came after fellow Flushing Meadows finalist Madison Keys tumbled out. Despite a strong fight by Stephens in the second set, Wang — spurred on by the home crowd in the 15,000-capacity stadium — proved too strong for the 24-year-old American. “I didn’t play a great match. But my opponent played very well,” Stephens said. “I went to see my grandparents. So no partying for me. I don’t party. I don’t drink. I don’t do any of that stuff,” she added. “The strength (of my wrist) has been the biggest issue… I’ve been dealing with it over the summer,” she told journalists. In other matches, Angelique Kerber of Germany, the 12th seed, fell to Caroline Garcia of France. While Agnieszka Radwanska, the ninth seed, beat Magdalena Rybarikova 6-4, 7-5.